Date: Saturday, 19. January 2019, Position: Belmopan, Belize, Mood: Top!! Due to the time change we were already out at 6am. The clock was not changed! So we could start the morning a little slower. All packed up again, we started at 9am. On board an American family, who celebrated a birthday and all had quite a hangover. The jubilarian had, like us, a lot of fun at the speed with which the boat raced through the meandering arms of the river. Somehow like in a sidecar, only wet and lively. But just as much fun! All kinds of things could be seen: Of cranes, eagles, immense termite nests, fishing Mennonites, baby crocodiles, birds and bats that had the ability to adapt to their surroundings and monkeys. Naturally nature, nature and nature again. Arrived at the ruins we walked through the jungle over bumpy terrain. Nothing is wheelchair accessible here. Neither the toilets nor the paths. It is quite a challenge for the company. 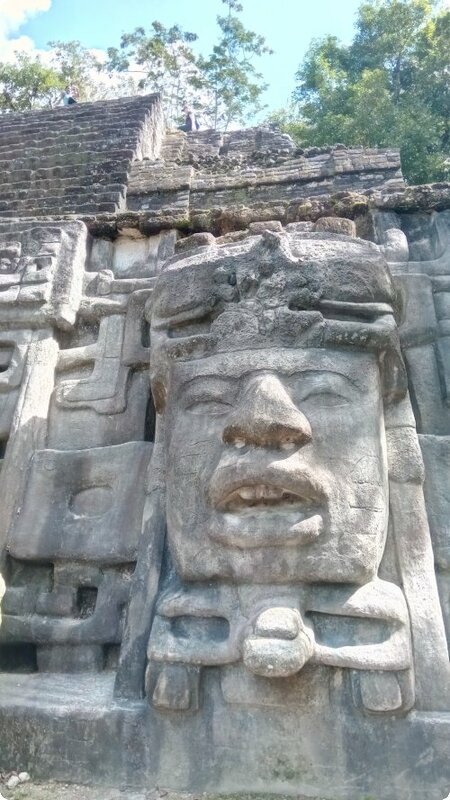 The Maya ruins are little visited due to the horrible affliction of the road leading there. The water way is clearly more pleasant, so it is said. Yes, and they were something different in so far as well preserved ornaments can be seen. Considering that the whole thing was built 800 years after Christ. Here it was special that the ruins were partly still covered with the traditional red clay. For lunch, there was a delicious meal of chicken, tomato salsa, rice with beans, fried hot bananas and pineapple, specially cooked for us by the mother of the guide. Simply successful. After approx. 1 hour rapid boat trip we were again with the Moped. Our destination is the official capital of Belize, Belmopan. The capital is rather insignificant and small. It was also only built there so that the capital is in the middle of the country. However, with a bunch of ministries of any kind. Whole streets long there is one at the other. We had found a hostel with huts, in which we finally accommodated all 4 for little money in a “Tiny Home” with four beds, kitchen and bath. A little paradise with a super cute and heartbreaking dog girl named Dotty. A puppy of 2 weeks that was found half dead in the ditch and brought to the hostel. Full of heartwarming. We had thought whether we could take her with us somehow. Especially Jesse fell in love with Dotty immediately. But not least because of the border crossings this would have been quite difficult. And at all. And there remains the question whether Dotty really would have loved the life of a motrradriven dog. Overnight it started to rain. But the next morning it cleared up slowly and we started our journey to the border to Guatemala. Beautiful Belize! Surely we could have spent more time in Belize to “hang out” on the beach in the south. But our choice fell on Tikal in Guatemala. Stay as you are! Just as we love you! Date: Freitag, 18. Januar 2019, Position: Orange Walk Town, Belize, Mood: Top!! 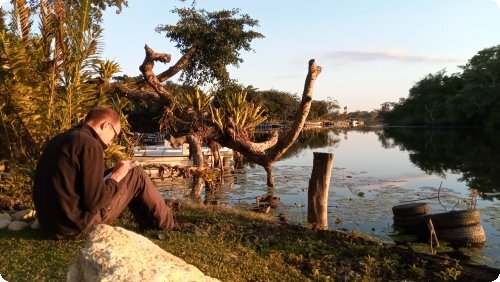 Now that we have some time here at the hostel in Cobán, Guatemala, since we will stay here for two more nights, I can finally write down my impressions of the past days. Due to our cruising speed of the last days there will probably be some of what we have experienced on the way. From the Laguna de Bacalar in Mexico to the border of Belize it was only a few kilometers to drive. We were warmly welcomed at the border. As always with our team. It simply opens hearts and doors. Toshi said yesterday that it was as if we were a comet’s tail of happiness, leaving traces of it with the people. The children call, scream, and run behind us until we disappear on the horizon. Some laugh and giggle as if we had made a funny joke. Toothless old women are standing around the sidecar with me in it, laughing themselves “half dead”. On the other hand the men look rather stealthily, and examine professionally the motorcycle with appendage. Hardly anyone has ever seen a team. I’ve heard of it, or from the movie, but not in real life. Everyone is amazed when I get out. Sometimes unpleasant for me when 30 people and 6 dogs watch. But the spectators act as if we were an important piece to study. Fully interested. The actual border crossing from Mexico to Belize was rather unspectacular, although not exactly done in minutes due to the export from Mexico and the import of our three motorcycles. Belize was at first sight very different from Mexico. Stone and wooden houses in English and American style, the food rather American inspired. Green, colorful and the people with African cultural influences. Clean, well-kept lawn. Our first stop was Corozal by the sea. The sea seemed even brighter and more beautiful to me. Belize is known for its beautiful offshore islands, which invite you to dive and snorkel. There is a large coral reef. But since we did not want to dive nor leave the moped alone, we were drawn inland because we learned about a Mayan ruin that can be reached by boat. Lamanai lies on the New River. Included in a booked tour there was free camping. After a very tasty lunch in Corozal we went to Orange Walk Town. Almost all place names in Belize are somehow special. Arriving at the river, an enchanted sight of the river awaited us. The sunset was enchanting. The groundskeeper, Elijah, 58, spoke rather toothlessly and stuttering, and therefore made English communication a bit difficult. Because in Belize English is spoken, which produced a wild gibberish of Spanish and English. A challenge after 3 months of Spanish. But as always, everything is possible. He offered us the freshly cleaned toilets. The boys even got a (cold) shower without shower head. He told us about the river, the German Mennonite villages nearby, and what can be seen in the river. For example, from the Jesus birds that can walk over the water (on the leaves of the irises!). And when they fly, they have yellow parchment-like wings that look like pleated. Quite pretty. Glowworms glowed in the dark, and later, when we drove down the river with a flashlight, we could see the red glowing eyes of crocodiles. They can be 5 m long here. Early to bed, because the next day it should go as soon to the pyramids. In the night it began to rain easily, but the morning awaited us with sunshine. It won’t get very hot here in the interior anyway, because it’s winter here too.